Description: Designed with a stunning profile for various residential and commercial environments, this intriguing ceiling fixture design defines a distinctive sophisticated aesthetic. 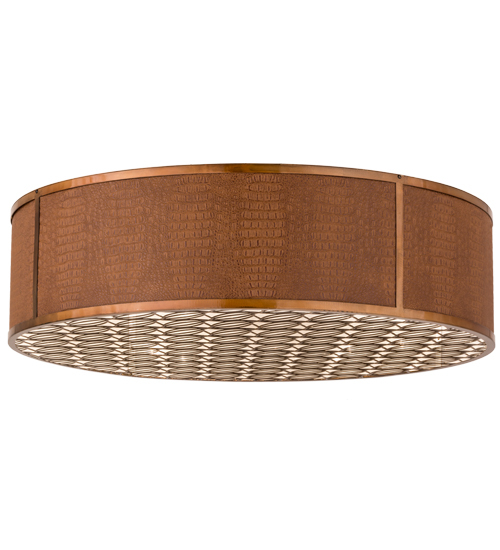 The unique Copper colored Alligator Skin-like diffuser is complemented with Transparent Copper trim and enhanced with a stylistically patterned grill on the bottom. Handcrafted in the USA, this fixture is available in custom colors, styles and sizes, as well as dimmable energy efficient lamping options such as LED. The flushmount is UL and cUL listed for damp and dry locations.